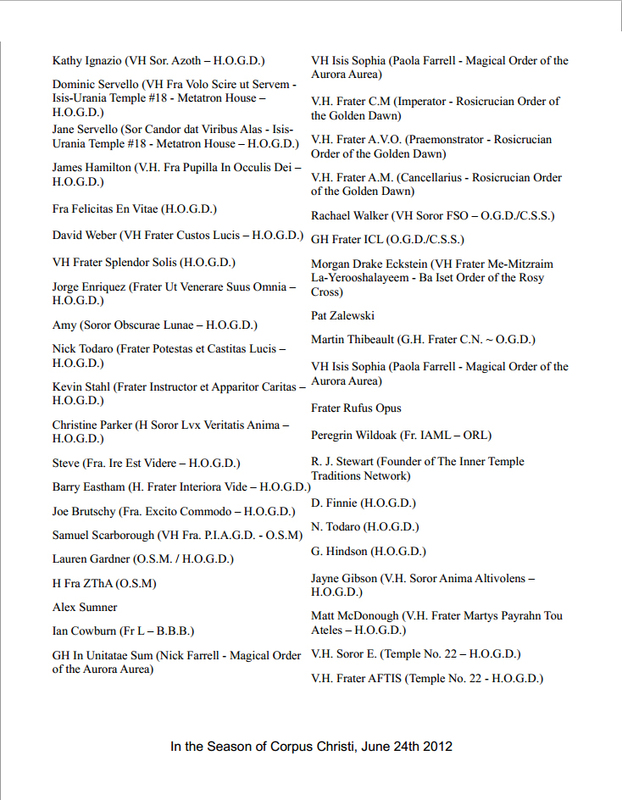 Commentaries and new papers on the Hermetic Society of the Golden Dawn. I was just remarking to a friend about the comparison of The Golden Dawn to Freemasonry. For many of us, there seem to be a lot of pagan influences in GD, which is an interesting turn of events considering paganism was revived from prominent GD members such as Fortune, Crowley, Yeats and Mathers. However, if you look to Masonic sources, orders like OTO and The Golden Dawn are referred to as "fringe-masonry". While this is often intended to be a pejorative, because these orders do not "make masons", their point that the modern lodge or magical temple structure comes from Freemasonry is well taken. But then again, a number of institutions and legal structures also derive from Freemasonry, such as Robert's Rules of Order, the proceedings of the House of Commons in my native country of Canada and in various other governments around the world. My understanding is that masonic by laws (bye-laws) were what the Canadian Provinces used as the model for non-profit societies, a bit of influential law still very much in use today. I can only assume a similar process may have occurred in the formation of not-for-profit laws in other countries, but as an occultist, this is going beyond my area of expertise. Historical reviews of the proto-elements that came together in The Golden Dawn and movements which came after the GD make an interesting study. Whether we are talking about masonic lodges as the basis for the GD temple (lodge) structure, or Windsor paints influencing GD colour magic, there are a number of constituting elements that come together to make The Golden Dawn, we can not accurately attribute it to only one source. I like seeing what Crowley wrote for the ceremonies in his later orders, which were written in the early 1900's after his involvement in The Golden Dawn and exposure to other fringe-masonic orders. A lot of insight can be gleamed examining what is similar and different in these various traditions. For example, in my opinion we can see that Crowley was likely using Ancient Freemasonry or the first three degrees of Scottish Rite to put together the OTO scripts. One example is because the prayers are always given at the Altar or coming toward the Altar in the early degrees of OTO, which is a feature uncommon in masonry - other than in the Ancient work, where the prayer is also at the Altar (and not the door to the lodge). While being familiar with other systems can make one a well rounded occultist, that doesn't mean that I recommend chucking a square and compass on the altar besides the cross and triangle in a GD temple. They are very different orders with different purposes. GD is a magical college, while masonry is exclusively fraternal and charitable. The same thing goes for mixing Thelema or any other magical traditions in with the GD work, such as folk magic or voodoo. It is just a bad blend, for just as the cosmetic similarities with freemasonry do not suddenly make GD masonic, what makes the various magical systems and religions different are actually key incompatibilities. These are serious distinctions, regardless if they both use psalms or there are similar verbiage or timing of where to give a prayer in a ceremony. For example, Crowley seemed to make an modus operandi of inverting every symbol to its "evil" position, and then making these symbols now become good in his new system of Thelema. My favorite examples of this are taking the supernal triangle from the Neophyte sash, and using it in a way that GD adepts would interpret it as the inverted triangle of evil, but then it suddenly becomes the holy child Ra Hoor Khuit on the robe of the AA Neophyte. He selects negative numerology, such as the GD qlippotic 11, which suddenly becomes "11 is the number of magick' in Thelema. It is like Thelema is a tantric or Hindu left hand path version of The Golden Dawn. In my meditations on it, I wonder if Crowley was actually attempting to terrorize the older occultists of his day by exclusively making use of this symbolism. The Golden Dawn seems to be working a redemptive formula through self-sacrifice, divine petitioning and prayer, while Thelema tends towards self-transformation through action. While I have learned much from investigating both systems, this is not really a good blend of philosophies or energies to be placed in one temple. In the 20th century, it seemed that the common approach to magic was inherently synthetic. What eventually was labelled as post-modernism, seems to have hit the innovators of the occult early, creating these massive hybrid systems of magic, like GD and Thelema. But nothing can stay static forever, and looking to the future we have to ask ourselves, what can possibly come after post-modernism that can qualify as a movement powerful enough to take its place? In the modern "post post-modern age", my opinion as to how these ceremonies will be enacted in the 21st century has changed. What I am jokingly describing as "post post-modernism" seems to be an approach to authentically recreate a time and a place. This is true in new clothing styles as well as local cuisine, the cutting edge today seems to be an attempt to recreate a time period as genuinely and properly as possible. This has been true in GD for some time now. The newer ceremonial temples are authentically working ceremonies that are dated from a certain time, with period handmade pieces of art, old scripts and an attempt to understand the attitudes that may have been the context of the time they hale from. Like their predecessors, these occultists know that magic is a living and growing culture, and must change to survive. But unlike the previous generation of post-modern magicians, the solution is not to let every idea or additional similar but alien approaches into the temple in some kind of universal stew of magic. Believe it or not, the "post post-modern" preference is to work within a certain limited framework, and rigorously exclude various ideas and influences that are not present in the original context. Gone are the days where the trickster coyote is solemnly proclaimed to be similar to the mercantile Hermes, or new age magicians stick quartz crystals on top of their GD lotus wands. It is ironic, because it is often argued that the New Age, Astrology, Thelema and Wicca owe their new popularity or revival to The Golden Dawn. Nonetheless, the current trend of the last ten years or more has been to try and understand magic in its original context first, without being influenced or even damaged by alien ideas being re-inserted back into The Golden Dawn from New Age teachings, Thelema or Wicca. This is not just in The Golden Dawn, for Solomonic practitioners are also experiencing some fulfillment with this approach as well. While I find myself very much in sympathy with this more nuanced modern approach, it does bring in a new set of unexpected problems that we must face. A perusal of the original documents will show that while the Outer Order ceremonies were always scripted, there appears to have been a high degree of flexibility to the early Inner Order rituals of the Golden Dawn. Therefore, if the modern temples are to do this authentically, we have to be careful not to rigidly apply one possible script when we could appropriately write our own, or trying to make an impossible copy of details or features shown in the older ink drawings of the wooden tools. Certain invocations and traditions that seem set in stone by the SM time period (as revealed print by Regardie) had actually started off as an instruction to compose one's own invocation using a set of sephirotic or planetary names. At some point during the process of journal copying leading up to the publication of the first SM ceremonies by Aries Press in the 1930's we lost this flexibility and the inner order system became entrenched in one set of consecration scripts. Overly rigid searching for source materials when the originals instruct us to compose our own, or literalism in constructing what is essentially a painted magic dowel can eventually skew our impression of what the old late 1800's GD order really was - a tradition in the midst of an intellectual and creative growth spurt. Looking at kabbalah in the 1600's, we find a similar creative phenomenon. It was an intense period of growth for Jewish Mysticism, and in his Kabbalah, Scholem points out that it was a very innovative time for the subject. He cites a number of ideas and influences from Neoplatonic and other sources. Meanwhile, in the later, post-messianic time-period, eventually we find the Hassidic movement beginning by hearkening back to the 1600's as the most authentic for the subject of Kabbalah. No problem there, but in practice, the 15 and 1600's were treated as a fixed orthodoxy. As much as I like the Hassidus, this is not what the history books teach, the 1600's were far more creative and flexible. While I am not an anthropologist, but rather a practitioner or occultist, I have heard similar remarks made about the oral tradition of some indigenous peoples. As I understand it, these traditions (in some cases spanning thousands of years) have been treated as a fixed source, but only after their publication. With Native American traditions, it is a really strange turn of events when those whose task and vocation was to promote the oral tradition now seem to prefer to fall back on the books of academics to tell them what their tradition really was. This, I feel, could be the chief danger in our new, though laudable, "post post-modernist" approach. We simply have too many books, and not all of them are correct. A study of our original materials show that there was apparently a vitality and flexibility in the Inner Order of the GD that had itself halted somewhere along the way. When we mix in other traditions, it can provide some innovation, but with the previous thirty years of people introducing crystals and too many other elements into the GD Hall, we are promoting a lack of certainty of what exactly the tradition is. Yes, there are common elements in different traditions. However, there are also differences, and I am not always certain our newest initiates really understand the distinction. We need to get back to the original approach, and this was limited to study of the right information, and continued practice. Now, I give some examples of similarities with Freemasonry, but then distinctions are drawn where the similarities end. This might be par for the course in an academic setting, but this is not always the methodology of the practitioner, who tends to prize utility of the moment over correct procedure and historiography. The Golden Dawn, while innovative in its day, never included wholesale adoption of these alien traditions into the order based on overly simplified but cursory similarities to the GD work. There is a limit to how far we can compare various traditions before we begin to lose resolution entirely. So, even though I see a potential for over-rigidity as a concern, I also am excited for what the future may hold. For me the solution is to try and stay loose in areas that won't damage the original paradigm. We should feel free to write our own inner order invocations, but continue using traditional names and attributes. We should make and thoroughly work with a set of traditional tools, but after a time, go ahead and make another new set for personal use using different colours, shapes, or even other sephiroth. Try using different sets of the traditional divine names. Do not initiate others with personal tools or unique ideas, always fall back on the traditional system as we have a responsibility to pass on the tradition as authentically as possible. However, do be confident to go ahead and innovate in your own personal work, for that is how we will grow and learn as a tradition for the future. Many years ago, I came up with the idea to work in a similar manner as in Santaria, but rather with classical Greek and Roman statuary. It would be challenging and prohibitively expensive to make a statue for each spirit or angel I had ever worked with, but this is what I wanted to do. Meditating on the idea, I came up with a solution, which was that I would only make seven statues, one for each planet. What makes the Inner Order of the Golden Dawn system different from other older traditions, is the introduction of modular tools. In the Golden Dawn, (or more correctly, the RR et AC tradition), certain flashing colours are employed to represent planetary and other astrological forces. For example, the Adept can use the Lotus Wand to invoke the astrological forces via the coloured bands or grips. If I was to make up statues of the planets, I could use them to invoke the various gods, angels and spirits, but in a modular fashion. For example, all the Venusian characters, such as YHVH Tzabaoth, Hanael, Kedemial, Astarte, Aphrodite, etc., could be invoked in a theurgic manner into a statue of Venus as a material basis. There first problem with this new formula was that I wanted to be able to use it for seal-based evocations as well as theurgy and the sigils would result in concentrating the sephirotic or planetary energies too specifically into certain names, which I knew would result in mildly kelipotic manifestations when I tried to switch pantheons. In the old order, some of the Adepti experimented with making a second set of elemental tools but without sigils, so I made the assumption that by extension these statues could also be left somewhat plain, to accommodate a variety of names for the one force being employed. This overcame my first concern. The second problem is the cleansing of the statue between entities. Thankfully, the Inner Order Z2 for evocation presents a highly effective license to depart and then banishing formula that doesn't appear elsewhere in magical literature. Depicted above is a photo of one of the deities I have worked with. It is a statue of Venus, after the Botticelli painting. For more information, see my book Adept Magic in the Golden Dawn Tradition, which may now be pre-ordered from the publisher Kerubim Press. Frater YShY (pronounced: Frater Yod Shin Yod) is a Past Imperator and one of the founding members of Thuban Temple in Victoria, BC; the Mother Temple of the Hermetic Society of the Golden Dawn. He is involved in various other lodges of the Western Mystery Tradition and Freemasonry, including the modern Asiatic Bretheren. He has a keen interest in the Golden Dawn, Jewish Kabbalah, Greek and Roman studies and tarot; as well as Talismans, Enochian scrying and Classical Evocation. His first book, entitled The Path of the Chameleon, is the modern al Tinnin Vault Zelator Adeptus Minor papers from HSGD. This presents his work on the Neophyte Formula and examples of his own completed Z2 rituals. The Path of the Chameleon is upcoming from Kerubim Press in 2013.
Review of "King Over the Water"
Every so often a publication comes along on the Golden Dawn that has the potential to change a bit of the history of the old Order; this is definitely such a book. Within its pages we find a new depth to old topics we have not seen considered in print before, and it offers previously unpublished documents that show a slightly different method of how the rituals could have been worked. There is also a commentary by the author that threads its way through each section that is both interesting and provocative. So, this volume provides a variety of content, and I am of the opinion that it will make a valuable addition for any serious magical library, being a must for anyone studying or practising Golden Dawn magic. King Over the Water starts with a section on the history of Samuel Liddell "MacGregor" Mathers, Golden Dawn co-founder, and Chief of his later GD off-shoot which he renamed the Rosicrucian Order of the Alpha et Omega, or AO for short. An important quality of the book is its historical approach. It has not been composed with the methodology or rigorous standards of history, anthropology; but rather from the magico-psychological perspective of a practitioner of the Golden Dawn tradition. Any brief perusal of its pages shows that it indeed dances between speculation on the psychology of Mathers, and the facts of various detailed historical events; all of which is informed by the knowledge and consideration of magical theory from the perspective of an operative magician. As magic does not yet have its own characteristic methodology or discipline, the book does not require itself to operate under the rigorous standards of another field of study; and the finished product takes advantage of this latitude. What it is, is a magical book written under the auspices of the Golden Dawn tradition; it is an internal history of GD magic written by a magician, for magicians. The places King Over the Water in a different category from the other extant works of GD history. While some other works demean the practical side of the subject, and others are written from a clearly demarcated historical perspective, King is accepting of the magical world-view, and takes a personal approach. All of the above are acceptable positions in my own opinion, depending on the author’s relationship to the historical material. Even the kindest scholarly representations of GD history have been penned carefully to avoid any discussion of the internal and transformative reasons for practising the tradition; in short, they are carefully written to avoid any discussion of magic. King Over the Water is not unlike other very popular books on Alternative History and Freemasonry in particular; such as the prolific publications of Knight and Lomas. Like these other books of Alternative History, King Over the Water indeed shares a similar, more casual, writing style. I did notice the use of the common vernacular was consistent throughout the book, and that the same cultural idioms that were oft-repeated. Some of these slang phrases were unfamiliar to me, and in places I found that a bit difficult to follow. As I progressed past the introduction, I grew accustomed to the style of presentation, which was more conversational and informative than the dry academic reading that I am more used to, and was actually expecting from this book. There was also a dour and surprisingly humorous quality to the content that I fancy will catch a few of the more serious amongst us a little off-guard. I quickly settled into reading King Over the Water and began to enjoy the content immensely. I agree with most of the conclusions and suggestive interpretations made about Mr. Mathers in these pages. I found the assessments of his faults and strengths to be accurate assumptions, and I was surprised how King Over the Water actually mirrored some of my own speculative opinions closely. In many cases this amounts to an undignified look at Mathers, but it is not necessarily an unwarranted characterisation, for at times there were indeed very foolish or unsavoury tales that must be told in order for the book to fulfil its stated objective as a historical work. In essence, it was a life story that was at times difficult for me to hear and discover portions of as a reader and GD aficionado, and a few times I found myself wincing at some of the stories. However, I recognise that the candidness was warranted and provided a most honest picture of the man. In this regard, and most importantly, I found the book's information to be detailed and accurate, and in my opinion the assessment of Mathers’ personality was fair, astute, well-thought out and reasonably communicated. The addition of the detailed obituary by John William Brodie-Innes is of course priceless and well-placed at the end of the book. Because as he was a close associate of Mathers, its fond and lengthy characterisation serves to confirm much of this book's main hypothesis about Mathers personality; all the while soothing out some of our impressions of his foibles with the kindness that a good friendship and long association can sometimes bring between two men. The book recognises that in any lay person's psychological analysis it is hard to be certain of conclusions such as this with anyone, even with ourselves, and much less with a long-since deceased person. At the same time, the book does not shy away from some of its more difficult descriptions about Mathers. This is a position I respect, for going back to my characterisation of the book's approach as 'magico-philosophical', in modern GD practise this level of self-conscious consideration should be present in the work of every a magician, and encouraging this open analysis is an important process to undergo personally as well as when considering the possible motives of others. In this regard, I heartily appreciated the attempts to interject only the right amount of uncertainty into the research being presented, and in this an academic method is emulated. This has the very much desired effect of rendering the new interpretations presented in King Over the Water as more plausible. For those of us in other areas of expertise who are perhaps unused to reading or participating in this sort of academic work, I would kindly share or volunteer that this is a standard methodology in historical works. Typically a paper or book presents factual information; makes conclusions which are sometimes new or difficult; provides some possible objections to its own thesis that seem logical, or may be from the intended audience’s perspective or the status quo; and then it finally overturns each of those objections and verifies its original thesis. It will not be hard for the average interested reader who is a non-expert to readily distinguish where the blanks are being filled in by speculation between the harder facts which are usually cited. While it is not mentioned in the body of the text, the biographical notes in the back cover make it clear that the author is drawing on initiatory experiences and oral traditions in the various GD related groups he has been active in. While reading, one is left with the impression that much of the information without citation is blended oral tradition and the author's own opinions, all of which I enjoyed reading. While it is written from the attitude of a practitioner, and as has already been mentioned, therefore has no obligatory requirement to take up a specific methodology in its approach; nonetheless, as a reader I was so captivated by some of the stories so much that I wished to know more about the sources of some of the information. A small criticism and request would therefore be that I would have liked to have seen even more historical citations presented whenever it was possible. As this book already shows all the hallmarks of a title that will be much sought-after for years to come, I expect will likely be slated for re-prints. Perhaps the need for more citations is something that could be rectified in future or new expanded editions. In a final analysis, the foray into Mathers and the old Golden Dawn’s history was well done. Particularly the sections on Mathers possible political motives and some of his unsavoury and extreme associations in Right Wing politics were new to me, as I expect they will be to many of King’s readers. I thoroughly enjoyed the political section of the book, while the publication of some of these older documents has been long overdue. The slight dabs of layman's psycho-analysis were warranted and will be much appreciated to anyone following a magical path. I have always felt that a genuine magician’s primary goals would be tertiary in nature: first, to develop a specialised skill-set; second, to better oneself; and third, to improve the world around us. Wisdom and insight are two inner constitutions life's maturity can take, regardless if one is working to better oneself through a magical path or not, and in this regard, ribald humour aside, King delivers. These commentaries were interesting, and I particularly valued those on the Vault. The section on the Vault walls was good, as well as the typescript and reprinted sections from an original MSS of Book of the Tomb, which is not available in print anywhere else; it has literally been a long-lost document to many of us. Now we finally have the painting instructions for the inside of the Pastos that are missing from all other published Golden Dawn books. Furthermore, the author offers a personal dialogue about his efforts building a Vault. While I do not always agree with the more personal magical theories presented in King Over the Water, no matter, because they are worthy as an Adept-level considerations, they are thought-provoking and intelligent, and so I enjoyed pondering them. I really can not emphasise this enough. 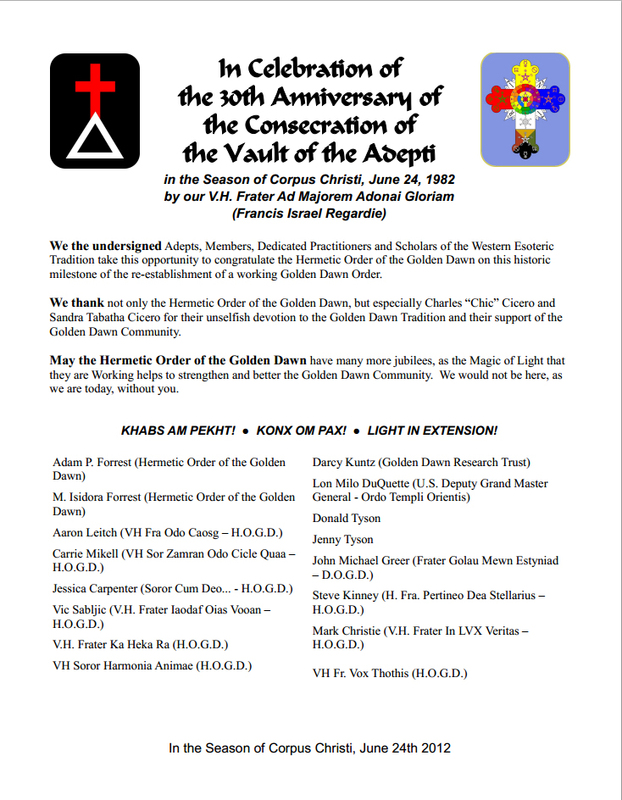 This level of Golden Dawn work is valuable, and by finally printing the Book of the Tomb and providing an insightful Commentary, this book proves to be an excellent reference and will take its place as the primary resource for Vault construction. For anyone serious magical practitioner of the Golden Dawn tradition, this tiny section alone is worth many times the cover price. I also thought some of the cipher musings were pretty astute. I have been a proponent of what the book terms as the "reverse-engineered" school for going on 20 years, which is the suggestion that the cipher itself is forged after or during the same time period as the rituals were worked out. I will not support this assertion in this review; rather, you can read all about it in King. The section on S.L. Mathers is about two-thirds of the book, and is therefore the main feature of attention; however, the original documents such as The Book of the Tomb and the full versions of the Alpha et Omega’s Z Documents, which are both printed here in full for the first time, are where this book really shines for the researcher. There is also a solid document on colour written by an anonymous modern Adept that is informative and helpful. There are only the most minor editing details that were missed and some Hebrew misspelling, but that is par for the course in any major undertaking such as this book obviously has been. I recall finding far worse mistakes in the various editions of The Golden Dawn by Israel Regardie, mistakes that we have all had to contend with for many decades before they were rectified in the newer editions. As always, when using information of this nature several texts should be compared, as the maxim goes: caveat lector. This small observation should not deter anyone from picking up this excellent book, there were fewer mistakes in King Over the Water than in your average popular novel has these days, and in this regard the editing staff did a good job. The pencil or charcoal sketches by Paola Farrell also deserve mention. They are very beautiful, and these pieces add a dimension and an elegance to the book that is lacking from other new books on the same subject that are inexplicably peopled with the usual fare of clip-art, or photocopied and pixleated wood-cut images. All-in-all, I think this book is an invaluable addition to the corpus of Golden Dawn reference books, and I am appreciative of its variety of contents. As the years pass, I feel this is a volume that generations of magicians will be grateful to have access to; and I would not be surprised if various Adepts are now repainting sections of their Pastos and Vault based on these newly available instructions! I have really enjoyed reading this book, and I encourage people to buy this and study it well, your efforts will be well repaid. King Over the Water by Nick Farrell. It is that time of year again where our members and many GD temples around the world are getting ready to celebrate the Autumnal Equinox. For many years that the mind of our membership runneth not to the contrary, after the meeting the members of Thuban Temple have happily debated the Element attribution to the Hall in the Equinox in the banquet room over a few pints. Most GD practitioners will have noticed it is slightly different than in the 0=0, as the Cup of Wine and Paten are switched in the Hall of the Equinox. I would like to share my own opinions on the matter. To begin, I feel a dogmatic summary of what we know from the rituals is needed, it is presented is in 3 points. This is followed by a few posits, and finished with an assumptive summary and a possible solution. We know that the altar setup is attributed to the "four prevailing winds of Britain", which is also used in Modern Wicca. While we know the rituals are written at different times, and this often creates different contexts, this alone does not explain the difference between the two placements in the Hall. In other regards, the setup for the two ceremonies is identical. So, why the change? If we take the Altar as symbolic of a type of Adamic Ark, bark or coffin; and the Elements as a four-fold representation of the sphere of sensation, the body of Christos, the Osirian Pharaoh's body in subdivision; the Astrological and Alchemical Elements which are the magical origins of the Jungian and Myers-Briggs personality traits and types, if you will, then it takes on a most personal interpretation; in a word, it is microcosmic. Therefore the 0=0 Hall becomes the tree that captures Osiris; the path of the flaming sword that guards the way to paradise; the world temple or universe; the esoteric Jewish traits that allow the divine presence to arrive and flow through the Kabbalist who faces the veil of the Shekinah which covers Yod Heh in the East; or even if it represents the simple, secular ideals of positive and healthy traits required to be present in a positive society; in a word, it is macrocosmic. If we agree on these above posits, then the Equinox must be a different model, one where the microcosmic prevails, it is a type of detailed analysis of the microcosmic. Few would question that it is composed of a theme that includes the elements. That it is different than simply a mirror of the 0=0, that it is more than just another event that we are now allowed to attend as Neophytes is another posit that will need to be explored. Portal also has a similar floor-plan as the 0=0 and the Equinox, with the addition of the veil before the pillars and not behind the dais as in the other grades. 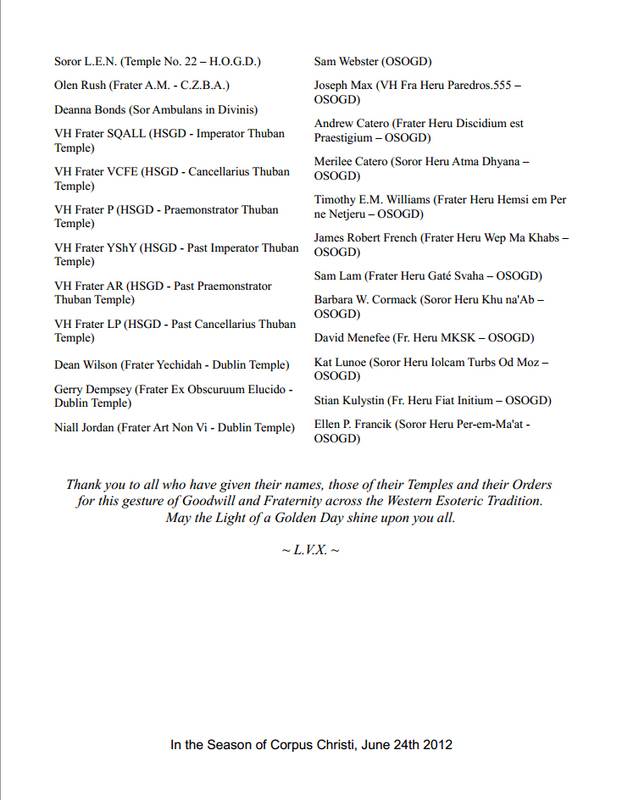 As it says in the opening ceremony "Fratres and Sorores of all Grades of the Golden Dawn in the Outer..." So, as we know, this ceremony is intended for all GD grades, and therefore it is probable that there are similarities. So what is the significance of these differences? The 0=0, among other things, explores this micro and macro relationship in relating the candidate to the universal. The elements of the altar are dismembered and placed on the tree, and then returned for the Eucharist. The Neophyte is therefore, among many other things, shown the method to be made holy by this process. As it is later echoed in the 5=6 rubric: "There is no part of me that is not of the Gods!" I can only assume Crowley understood this when he made the above 5=6 line originally appearing the the Book of the Dead central to the other great Eucharist of the magical tradition, his Gnostic Catholic Mass. So, if the Equinox does not simply mirror the 0=0, then what is it a model of? You may recall that during the Equinox, each Elemental Officer makes a cross in his or her station with the attributed Element, and the Hegemon with the Kerux's lamp. I suggest that with all its crosses, it is a series of five 'Elemental buds' if you will, that will later bloom into the Outer Order Grades. The Elemental crosses in the Equinox are referencing the Watchtowers of the Universe, acting through the agency of the four winds or directions. Why? Because the attribution used in the Equinox is where the Enochian Tablets of Watchtowers are or are to be located in the Hall during the Outer Order Grades; because the Elemental grades are also personal and therefore microcosmic; finally, and most importantly, because the Equinox ritual itself is based on Solar and seasonal themes more than it is only the Kabbalistic tree facing Yod and Heh as in the 0=0. It is instead to represent a more myopic focus as its main feature, the altar is expounded upon personally before the Eucharist common to the 0=0 and the Equinox. It is the seasons and the individual that is to be concerned here, the ritual is representing the two points of the year that are in balance between light and darkness, just as in the various Solar myths common to the assumptions about the Egyptian and Mediterranean Mystery Schools made by 18th Century Freemasonry, that, for good or for ill, informed the writers of the Golden Dawn ceremonies. These Elemental Crosses mark the locations of the Enochian Tablets, and are similar in nature if not identical to the Black Cross of the Tablet of Union and the Great Crosses of the King and Senior's names that are used in the Elemental Grades and the Ritual of the Portal. 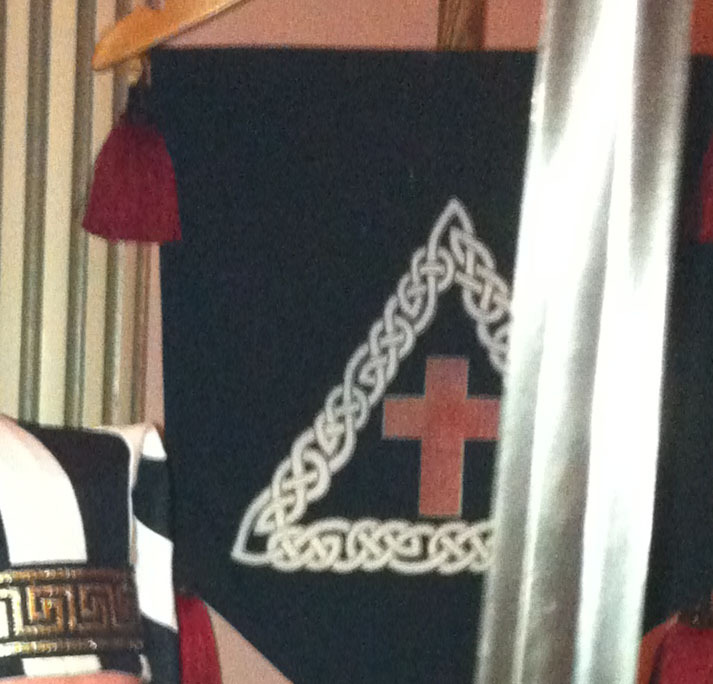 These also mirror the Crosses that are brought upright into Pentagrams by the forces shown in the Portal Ceremony. Therefore the Equinox becomes a sort of Microcosmic model that summarizes the entire process from the 0=0, through the Elemental grades, and crowned in Portal. In other words, the Equinox is a map of the personal territory the initiate is about to undertake in the Outer Order, but it is not the journey yet. It is appropriate for the initiate to experience balance and wholeness in a representative ceremony at the Equinox twice yearly. This is a social and internal affirmation in the Eucharist, but not the complete accomplishment of the great work; it is a taste of self-balance and individual wholeness before these traits are actualized in the personal success that characterizes the ideal of a full Adept. As the Hierophant says in the closing ritual "May what we have partaken maintain us in our search for the QUINTESSENCE, the Stone of the Philosophers. True Wisdom, Perfect Happiness, the SUMMUM BONUM." The Equinox is a microcosmic representation of the raw matter in form, like the 0=0, but not only as compared to the journey up the tree collecting the divine sparks as in the 0=0 and the Elemental Grades. Instead it is showing the perfected being as an ideal in the Solar myths through the Elements and Watchtowers; it is the entire subject of the Seasons in relationship to the unrefined soul in each of us; elements, dross, gold and all.